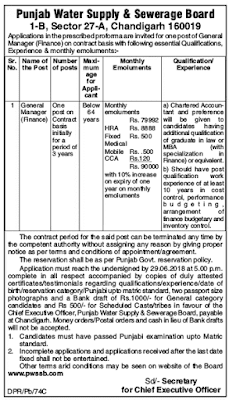 Punjab Water Supply & Sewerage Board (PWSSB) has recently given a notification of 01 General Manager (Finance) Jobs on the contract basis for a period of 03-years. The interested candidates apply for the PWSSB Recruitment 2018 on or before 29 June 2018. Punjab Water Supply & Sewerage Board Recruitment 2018-19 notification is out. As per the Notification, there is 01 General Manager (Finance) Vacancy. The educational qualification is Charted Accountant (CA) or LL.B or MBA. The age limit is below 64 years. If you are looking for Govt. Jobs in Punjab Water Supply Department then this article is going to be very helpful for you. Charted Accountant (CA) and preference will be given to the candidates having the additional qualification of graduation in Law or MBA (with specialization in Finance) or equivalent. The candidate should have post qualification work experience of at least 10-years in cost control, performance budgeting, the arrangement of finance budgetary and inventory control. The age must be below 64 years. Rs. 79992 Fixed + HRA + Medical + Mobile + CCA = 90000/- per month. Bank draft of Rs. 1000/- for general category candidates and Rs.500/- for Scheduled Caste/ Tribes in favor of the Chief Executive Officer, Punjab Water Supply & Sewerage Board, payable at Chandigarh. You can send your application to the Secretary for Chief Executive Officer accompanied by copies of duly attested certificates/testimonials regarding Qualification/ Reservation/ Date of Birth/ Experience/ Punjabi up to matriculation on or before 29.06.2018. Last Dates: 29 June 2018.